Taurus games offer a vinyl `mat' style board for four player chess (with a cross shaped board) for sale. The board can be rolled up, and washed. The set, currently for sale for 15 dollars plus 3 dollars shipping and handling, contains a rule book. All the rules of regular chess apply. All the queens start on white squares. Partner's sit accross from each other. White moves first and play continues clockwise around the board with each player moving one piece per turn. To conquer an army you must actually capture its king. When a king is captured the rest of its army remains exactly where they are on the board and they become immobilized and cannot move, except they may only move to capture enemy pieces, including the enemy kings! Those pieces may also still be captured by the enemies. You may choose to pass rather than capture on any given turn after your king is captured. Capture both enemy kings to win the game! Since you must capture the enemy kings to win the standard rules for check and check-mate do not apply in this variation. Players should still announce check as a courtesy, but players are always free to move any piece they want on their turn, you do not have to get out of check, you can even move into check if you like to live on the edge! HAPPY GAMING! Author: Hans L. Bodlaender. Inventor: Stephen R. Stockman. 2006 World Chess Variants Championship on-line . World Chess Variants Championship. By Stephen R. Stockman. 4-Way Chess . Commercial fourhanded chess variant. I'm not clear on the promotion rules for this game (no Game Courier games thus far have included promotions, btw). My guess would be that a pawn must promote when it cannot legally move otherwise, if it moves. However, captures make it possible for a pawn to reach some pretty strange dead end files, not necessarily in the opposite end zone to which it began the game(!). As a long aside, I'm toying with the idea of making a variant(s) on 4-way chess for Game Courier (there exists one for a so-called Double-Capablanca 4-way chess version already, but it's little played so far). In looking at the Alfarie: Many piece set, there is offered a small number of piece types for several coloured armies. These piece types include the Rotating Spearman piece, but, frustratingly, I cannot see the use of it for play on Game Courier at least (it could be used just for a page of a game, however). That's as there is offered only one figurine (each colour) with the spear pointed straight ahead, not at least two more of the various colours where the spear is diagonally turned to the left or to the right (not to mention other possible orientations for e.g. 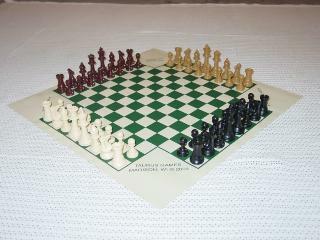 a 4-way chess variant board). I like the concept of multi-player chess variants (or ones in which two players each control more than one army, which is how this game is currently played on Game Courier), and perhaps there ought to be more of these. The problem of how to handle the surviving pieces of an army whose king has been captured (if not mated) may be a bit tricky to do in a reasonable way (i.e. in order to make it worthwhile for good players continuing to play out such a game further, at least at times). I think this particular variant seems to solve that problem well enough - if nothing else the variant is well tested and continues to be played, I gather! My tentative estimates for the piece values in this variant would be: P=1; N=2.5; B=3.25; R=5.75; Q=10 and the fighting value of a K=1.6 (if the first of one team's kings is captured, ostensibly winning an exchange value of 1.6, add to this exchange value a periodically recalculated bonus of [sum of the value of the pieces and pawns in the remainder of that king's army, for as long as any of it remains on the board]x0.8 for virtually immobilizing the remainder of that army, with full value awarded for any virtually immobilized pieces that are subsequently captured); note that naturally the second of a team's kings cannot be allowed to be captured without the loss of the game. Roberto Cassano just conceeded his match to me at 4-0, therefore I am extending the tournament entry deadline indefinitely, so if anyone wants to try to beat me for the 2006 World 4-Way Chess Championship and the $250 Prize I am still accepting all challengers. Entries for the 2006 World 4-Way Chess Championship on-line will be accepted until August 1, 2006. $250 First Place Prize is guaranteed by Taurus Games. Games will be played by regicide rules, partners can confer in the tournament. When i play over the board with friends we usually play no table talk allowed, but its up to the players to agree on kibbitzing rules b4 the game. The standard email - tournament time controls will be used in tournament games.